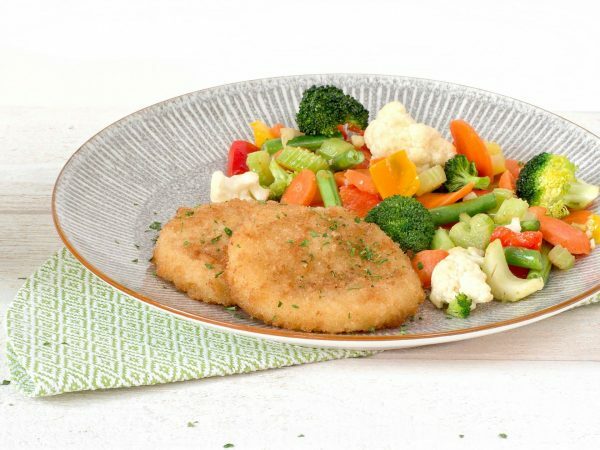 The Cheezy Schnitzel is richly filled with vegan cheese. Deliciously creamy and crunchy. A vegan Cheezy Schnitzel weighs 75 grams. 47% vegan cheese preparation (water, modified starch, coconut fat, olive oil, rice protein, salt, acacia fiber, stabilizer (tara gum), preservative (potassium sorbate), acid (citric acid), colouring (beta-carotene, E171), natural flavourings), breadcrumbs (wheat), water, flour (wheat, maize), sunflower oil, modified starch, pea fiber, salt, raising agent (sodium carbonate), stabilizer (E450). Produced in a facility that processes peanuts and nuts. Frying pan: 6-8 minutes on moderate heat. Turn every now and then. Oven: 10 minutes at 180°C. Turn once.